Abstract: We present RCAP, a new trajectory planning algorithm for virtual humans. 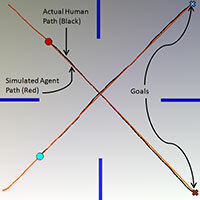 Our approach focuses on implicit cooperation between multiple virtual agents in order to share the work of avoiding collisions with each other. Specifically, we extend recent work on multi-robot planning to better model how humans avoid collisions by introducing new parameters that model human traits, such as reaction time and biomechanical limitations. 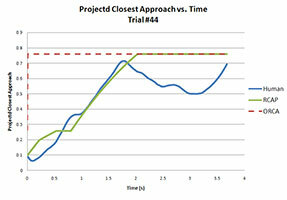 We validate this new model based on data of real humans walking captured by the Locanthrope project. We also show how our model extends to complex scenarios with multiple agents interacting with each other and avoiding nearby obstacles.